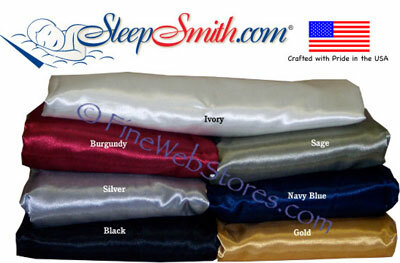 Our satin sheet sets come with a top sheet, a fitted bottom sheet and one pillowcase. RETURN AND CANCELLATION POLICY: Please try your sheets on your bed before laundering them to make sure they fit properly, washed sheets will not be accepted for return. Follow all washing instructions on label. Please note that our sheets, comforters and mattress pads, etc. are all custom sewn for you when you order. We do this so we can offer many colors, custom sizes and thousands of combinations. Our bedding is custom made for you, please measure and order carefully. Cancellation of an order is generally impossible as we start sewing ASAP. We can only accept returns within 30 days of order, a 50% re-stock fee will apply. The bedding must be returned in the original packaging. Bedding that has been used or washed is not returnable. Please note that you are responsible for all shipping costs.